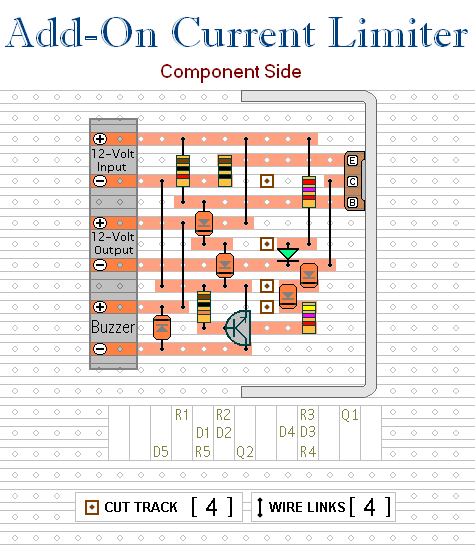 The basic circuit is shown in the first schematic. The two diodes fix the maximum possible voltage - on the base of the Power Transistor - at about 1v4. This means that the maximum possible voltage across R2 is fixed at about 0v7. If R2 is 10 ohms - then the maximum possible emitter current is (0v7 ÷ 10) about 70mA. I used a BD131 because that was what I had available. However, any NPN Power Transistor with a similar - or better - spec should work fine. I had no special reason for choosing a 70mA maximum. 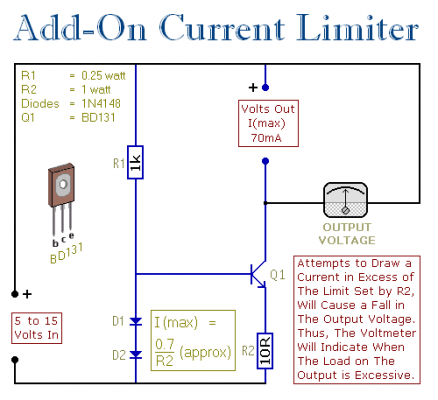 If you want to set a different current limit - change the value of R2. The formula is in the diagram. Always remember that if you increase the current - you'll also increase the watts. 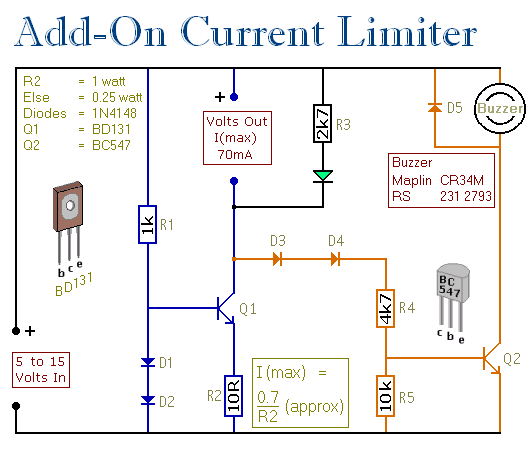 Where the Current Limiter is to be left unattended for any length of time - say during a soak-test - the Buzzer is useful. Should a problem develop - and the output voltage fall by 2-volts or more - the circuit will sound the alarm.